I’ve kinda always been baffled by how much chicken breast Swedes eat. Chicken is great and all, I mean… except for the breast. It is always, ALWAYS overcooked which makes it papery dry, flavorless and completely uninteresting. It can be great, but that really demands a pretty good chef I feel. So wasn’t this supposed to be about duck? Well yes. Since I’ve started eating duck more frequently I’ve been equally baffled, but the other way around. 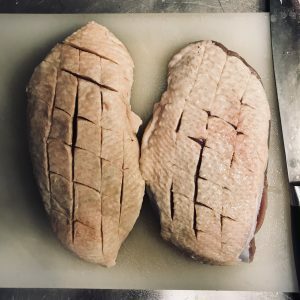 Basically, no one is eating duck, but compared to the bland chicken, the duck breast is amazing! How to describe it…? It has a certain gamey (duckey) flavor that I guess some people do not like. It’s very meaty as bird meats go and the breast is very tender and juicy. Kind of a mix of dear and chicken maybe, with more fat (from the skin). Anyway, more people should eat duck is what I’m trying to say. And stop eating so much chicken breast, it really is settling for mediocrity. This recipe uses a mix of pan frying and sous vide cooking. The pan-frying gives wonderfully crispy skin and the sous vide ensures just perfect meat. 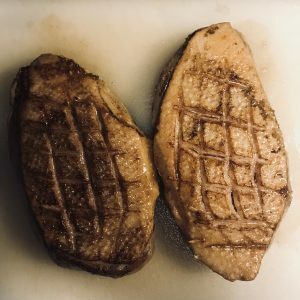 Sous vide is a great technique when you’re cooking meat and you really want it to come out a certain way (and really… when don’t you want that?). A sous vide machine is basically a water bath with a thermostat and a timer. It allows you to immerse the meat in water (sealed in a vacuum bag) at an exact temperature for an extended time. So instead of cooking the meat at a high temperatur (e.g. 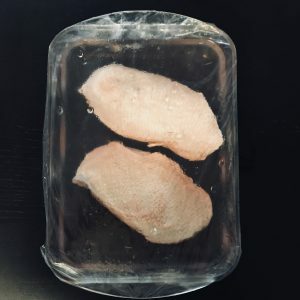 against the bottom of a frying pan) and trying to time it so that the core of the meat is juuuuust right, with sous vide, you cook the meat at the temperature at which you prefer the meat to be eaten at, but for a long time. Thus the meat comes out perfectly throughout the entire piece, instead of being overcooked at the surface and perfect in the center. It’s pretty easy to achieve kinda almost the same great result with only pan-frying (keeping tabs on the core meat temperature with a cooking thermometer). If you have the time: put the breasts in brine overnight, or a couple of hours before starting to cook, if that’s what you have. Dissolve 50-60 g of salt (ca 1/2 dl) in 1000 g (1L). Let the solution cool and then put the meat in the brine (the salty water). Brineing makes the meat more juicy and gives it a nice saltiness. Make broth. Cut some carrots, onion and fennel and put in boiling water. Add salt, pepper and bay leaves and let boil for at least two hours. Cut slices across the skin of the breasts with a sharp knife. This will make the skin more crispy when you fry it. Some might say you should “clean” the meat from tendons and stuff (on the “inside” of the breast/ the non-skin-side), but I really don’t mind them so I usually don’t. Put the butter in a pan on high heat with a sip of rapeseed oil. 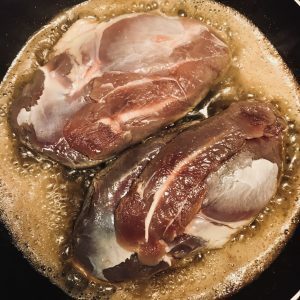 When the butter starts to brown, fry the breasts skin side down for about two minutes, while continuously scooping the butter from the pan and pouring it over the meat. Take the meat from the pan but do not throw away the butter, you’ll use it later. 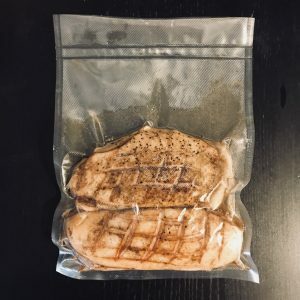 Seal the meat in a vacuum bag and put it in the sous vide machine (I can really recommend this one, it’s great and doesn’t take up a lot of space). If you did not brine the meat, salt both sides before putting into the vacuum bag. Cook for at least two hours, three if you have the time, at 54 degrees C (medium rare). Oh, and by the way: you can put whatever in the bag with the meat. If you want more even orange-taste in the dish, put in some orange peel. Like rosemary and thyme? Throw some in there. Now for the sauce: Grate 1/2 of one orange and squeeze the juice from all of them (circa five oranges should give you 3 dl). Put the starch in a bowl and pour in the broth (2 dl) while whisking. Add the wine, the orange juice, the peel and the sugar while whisking. Put the mixture in a pan, bring it to a boil and them let it simmer for 20 minutes. This should make for a quite “thin”/ runny sauce. If you like it thicker, add a bit more starch in the beginning. Add about a table spoon of butter to the sauce and you’re done. When the meat is done bathing take it out of its bag and put the frying pan (with the melted butter from before) back on the stove on high heat. When the pan is hot, put the breast in, skin side down and repeat step 4: Two minutes on high heat while scooping the melted butter over the meat. Then remove the breasts from the pan and let them rest for five minutes. Make thin-ish slices. Serve with the sauce and a nice side dish. Bon appetite!